Dont let that poster fool you. And dont let that diabetes-inducing OP get to you either. Better yet, dont hide your iPhone or iPad or block your computer screen from your friends (or even parents) while you are watching this series. This is a GREAT show to watch. The one thing that disgusts many, if not all viewers of a harem series is the blatant showing of cleavage, innuendo, and moe with little to no regard for actual plot progression and storyline. To them I offer this statement: This anime is perfect for you. As they should be, each of the love-struck girls gets their own personal story that revolves around the main protagonist Eita (who has unbelievably many nicknames in this show). But in addition to that normality, the main heroine of the series (in my opinion, but strongly backed by her airtime and exposure in the series) offers a fresh approach to building a relationship. Masuzu (the white-haired girl) procures Eita as a "fake boyfriend" to ward off the men constantly nagging her due to her "beauty and popularity." She does so by blackmailing poor Eita. This is what caught my interest. Not only is it a funny way to start off a harem, but the means by which she blackmails him is hilarious! I'll keep her method a secret for now. Inevitably, more girls come into the picture and yes there are a few heart-wrenching tear-jerking moments, but hey, what good anime doesn't? Each episode makes you connect more and more with each of the girl's perspectives and their view of Eita-kun. Undoubtedly, you may end up rooting for all of them at some point or another. The good thing is that there is no clear-cut winner of Eitas heart. Anyone who watches this can pick a girl and be happy about how she gets to hang out with him. Theres something in this show for everyone. Bottom line: This is DEFINITELY not your average harem. As then first episode progressed it just naturally grew into me. It had everything a good show had to offer to get me hooked on. Through the series it had events that led me to want more and more. Overall it was amazing although the ending was quite bit of confusing but that doesn't mean it was great (:! Short and Sweet of it: if you like harem comedies, this one is written decently, the characters are somewhat engaging, the animation is smooth, and overall it wasn't a bad use of time. Had effort behind it and wasn't just going through the motions. If you hate harem comedies, stay away. This follows most of the tropes. Should be more popular than it is. This is a surprisingly good show. I found it, like, 3 pages into the "popular anime" section, well below a lot of garbage. Definitely give it a shot, you'll be very happy you did. It's cute, funny and the characters are mostly interesting. I would say that the ending wasn't quite what I was rooting for but it still put a smile on my face. This show was the most fun I've had with a Harem series. Each one of the girls, though being stereotypes in a general regard, are still fun and interesting to watch. The dynamic of the show works really well and the jokes are actually really funny, instead of just being gag and perverse. Eita is actually not completely useless and has honest relationships and feelings for each girl. 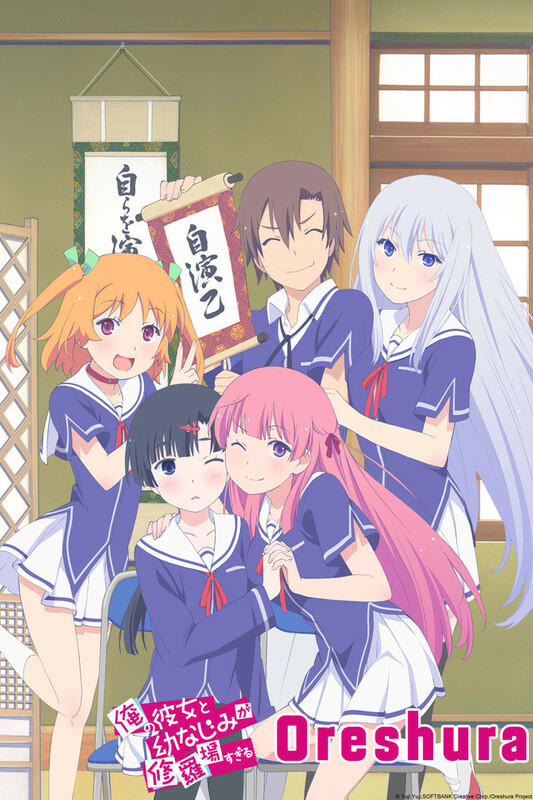 I really recommend Oreshura to those who typically enjoy Harems as well an any who are just looking for something silly and enjoyable. One of the best anime, PERIOD. Average. Does not distinguish itself from the crowd. The original premise of the main character was an interesting take on the genre, but it only took a few episodes before he seemed to lose those qualities. As more girls are introduced, he becomes indistinguishable from other harem males. Maybe if they do a second season, those points will be emphasized once again. The art and character designs were nice though, although there were really only two characters who had enough story to make them interesting. First Anime Series I've watched. Wow I watched this series "marathon style", I could not stop, how fun! Lovable characters, interesting plot, great animation. I am hoping to find more shows like this one and I do sincerely hope they have a "Season 2", although I read that's quite unlikely. Loved it!!! Cute Anime. A Must watch. I love this anime. What amazed me was the art design. Everything was beautiful from the characters to the backgrounds - I give the art designers a big thumbs up. This anime is fun and cute, I do recommend this to anyone who is in to Romance/Comedy. アリガトウ/Thank you.